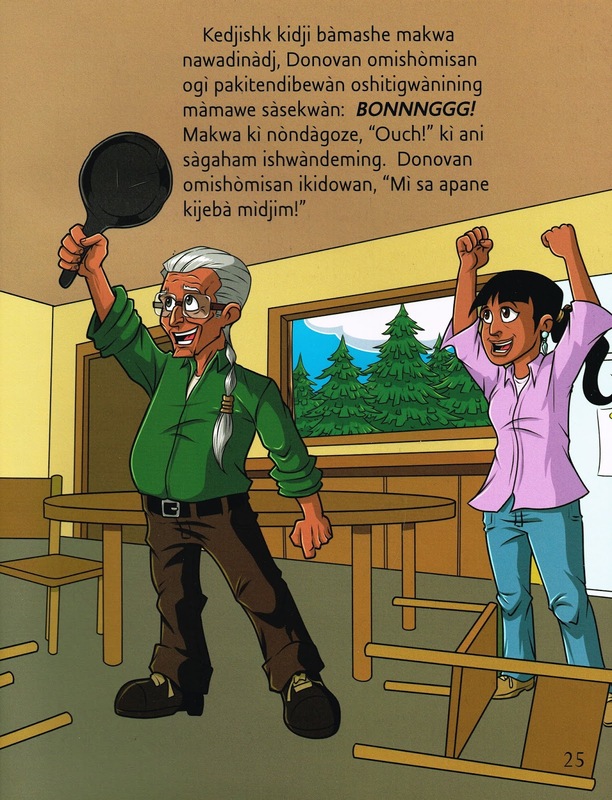 Robert Munsch's picture books have become a staple of youngCanLit from the publication of his first book almost 40 years ago and, with Bear for Breakfast / Makwa kidji kijebà wìsiniyàn, Robert Munsch continues to provide diversity in his story-telling, always honouring young readers whose lives provide the basis for his tales. After young Donovan bemoans that there is nothing to eat, much to his mother's surprise who has filled the refrigerator with her shopping, he is reminded of his grandfather telling him he used to eat bear for breakfast. So grabbing a rope, Donovan heads out to snag a bear for their breakfast. With the "thump, thump, thump, thump, thump" of his feet, and calling out "Bear, bear, bear, bear, bear!" 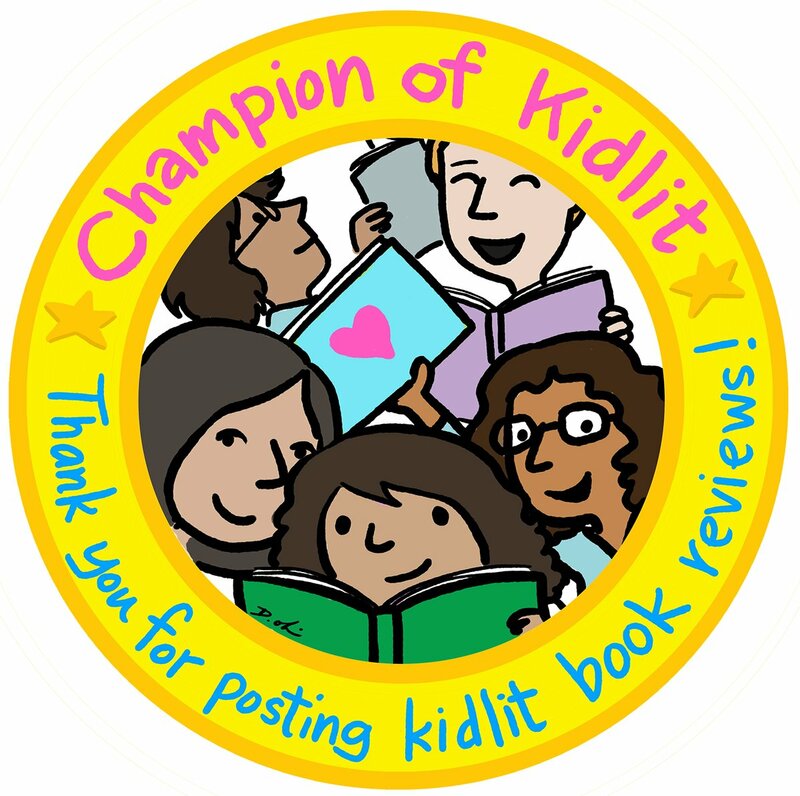 Donovan is often answered by a refrain of "Kid, kid, kid, kid, kid!" Spotting an ant or a squirrel or a dog, he shoos them away. But when a bear appears to his call and growls at the boy, Donovan starts to tiptoe away, before walking quickly with a pat, pat, pat and finally running with a whomp, whomp, whomp as fast as he can home, though with the bear following. It's only after Donovan's grandfather takes a frying pan to the bear who has crashed into the house that they are able to finally eat breakfast, and it is definitely not bear. 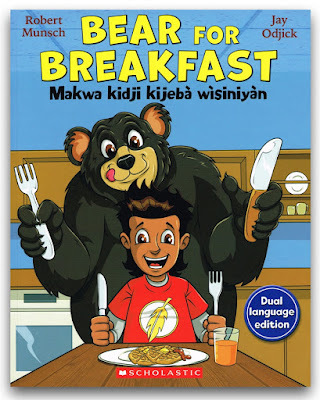 Bear for Breakfast / Makwa kidji kijebà wìsiniyàn has all the trademark Robert Munsch elements of a child's bravado, humour in all the right places, and repetitive lines and action sounds that little ones will want to help read. Though many will not be familiar with eating bear for breakfast, those children for whom it is not unfamiliar will appreciate acknowledgement of their experiences. 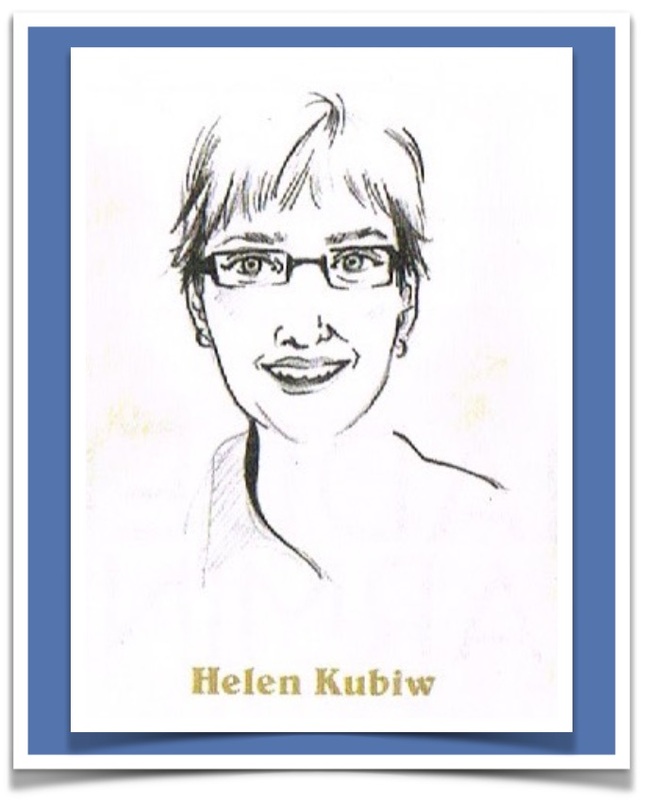 To help embed that experience, this edition is a dual-language one of English and Algonquin, translated by Joan Commanda Tenasco. 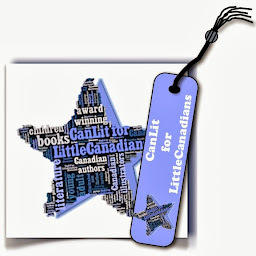 Useful for children familiar with one language and learning a second, dual-language books have been suitable for English-language learners but recently they have become increasingly popular in Canada to help preserve Indigenous languages. Although I have seen Cree, Inuktitut, Michif and Mi'kmaq editions of dual language books, this is the first I've seen in Algonquin and, by providing a translation of a Robert Munsch story, Bear for Breakfast / Makwa kidji kijebà wìsiniyàn will win new readers across cultures. 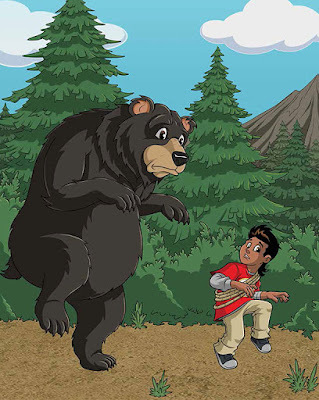 Moreover, with Anishinàbe artist Jay Odjick's illustrations to add veracity to Robert Munsch's words, Bear for Breakfast / Makwa kidji kijebà wìsiniyàn becomes more of an Indigenous cultural experience than a silly animal story. From the outdoor scenes of coniferous forests, typical of La Loche, Saskatchewan, the home of the Donovan who inspired the story, to the boy's home's decorations of a thunderbird and other Indigenous art, Jay Odjick ensures a genuineness to Donovan's story. Though young children will be able to see themselves and their family in Donovan and his mom and grandfather, little touches like Donovan's T-shirt with a feather and his grandfather's braids add a distinction that shows respect for another culture and its ways of living. 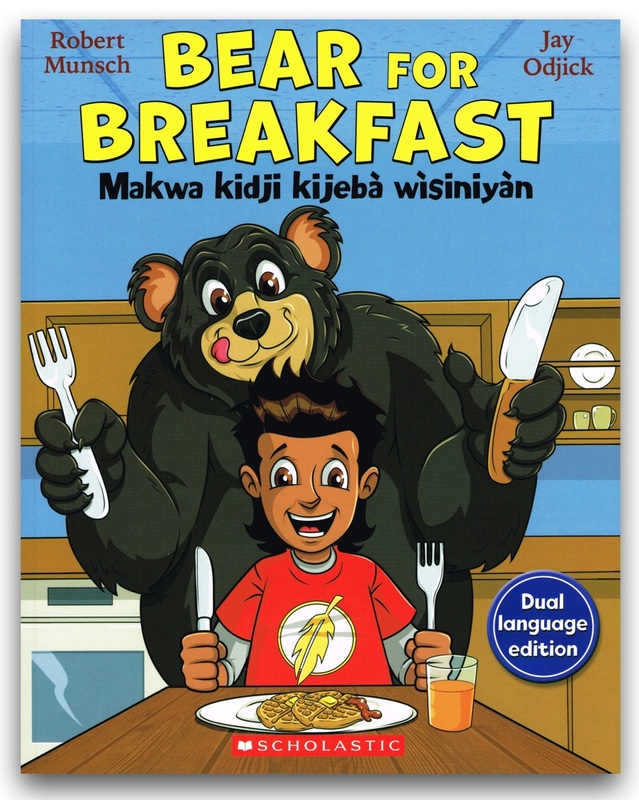 Whether you choose the English edition of Bear for Breakfast or the dual language edition of Bear for Breakfast / Makwa kidji kijebà wìsiniyàn (there are also French and French-Algonquin editions), there will be enlightening discussions about cultural meal choices along with animated story-telling. Clap, clap, clap.